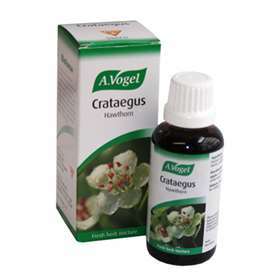 A. Vogel Crataegus works by improving circulation and the efficiency of the heart muscle. It helps to increase blood flow in the coronary arteries, improving the effectiveness of the heart pumping action. This helps to balance out blood pressure - a helpful remedy for both high and low blood pressure. This will also have a calming action on the heart. Fresh Crataegus Oxyacantha (Hawthorn) seeds, extracted in alcohol (50% v/v).